This media is truly versatile and a cost effective option for your car window advertising. One way, also known as contra vision can be used by itself for instant impact or in conjunction with a vinyl wrap. Traditionally installed to the rear window of the vehicle, the team at Signarama Joondalup / Osborne Park can tailor a solution that works within your budget and company branding. The self adhesive vinyl is applied to the exterior window surface and due to the perforations in the film, it allows light to transmit through. Having the graphic installed on the exterior of the window, ensures that demisters that are located on the internal window surface, are able to still operate unaffected. Being a perforated film, means it has privacy qualities and from the exterior people can’t see in, but your visibility remains clear when looking from the inside out. The inks are digitally printed on the film and as the human eye notices brighter colours over blacks, it is still able to form the shapes and text, even though the perforations have no ink to fill in the space. Not all window shapes are the same and it’s for this reason, we recommend using our in house designers to come up with your design. Their knowledge and expertise ensures any important information isn’t covered by the windscreen wiper or misshaped by the glass curvature. They will also take into account the visible area, verse the print size. This is important to make sure when the graphic are installed, the media isn’t trimmed to cut off text or icons. 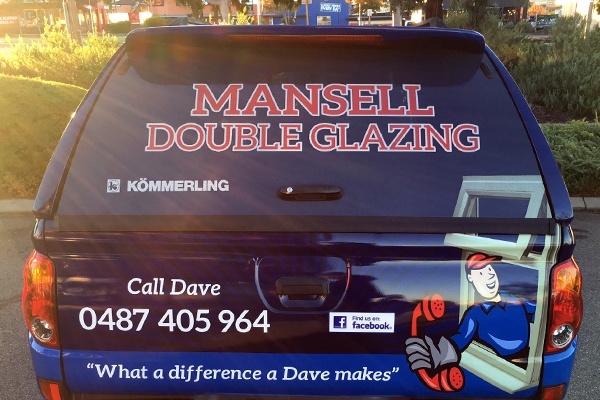 It is our aim to design a rear window graphic that represents your companies brand in the best possible way. Being a 3M platinum select installer, with trained professionals that make up our team, Signarama Joondalup / Osborne Park guarantee that your graphic will be installed correctly and backed by an after sales warranty. There are arguments both for and against the use of over-laminate on one way. At Signarama Joondalup / Osborne Park, we side with the against argument. Although the graphic won’t last as long as an over-laminated digital vinyl, the one way will be less susceptible to volcanoing. This can happen from trapped moisture during the installation process. Installers have to use a wet application method and if all the moisture can’t be squeezed out, it settles in the perforations of the film. As the moisture heats, condensation forms and tries to escape, forming small pockets of air. Because it is trapped between the window surface and over laminate, the pressure pushes the graphic off the window. So long story short, you get ugly bubbles in your graphic, which can cause visibility issues. Other considerations with window graphics is that in wet weather conditions, your visibility can be restricted. We would always recommend meeting with one of our friendly Sales Representatives to discuss your best option and if oneway is a practical solution for your car signs. Does this advertising graphic solution give perfect vision out of the windows? Not as perfect as if the film wasn’t on the car window, but pretty good. However, when the film is wet, vision can be more restricted as water can cause the vision to deteriorate. Will this film last as long as normal vehicle grade vinyl graphics? Unfortunately, not quite as long. It is deemed to be a medium term promotional film, not a longer term film like 3M vehicle graphics. Normally, it will last around 3 years before it should be refreshed. However, the back or side windows are some of the premium and most visible advertising spaces on your car, so sometimes it is a good trade off for all of the calls and work you will get off your car window advertising.